If you’ve been following the site lately, you’ll know that I’m currently en route from New York JFK to Cape Town via Amsterdam on KLM and that I had an extremely frustrating time securing Economy Comfort seating on KLM that required conversations not only with live representatives at both Delta and KLM as well as having to Tweet each of them until someone at KLM was finally able to assign me the seats I thought I had in the first place. 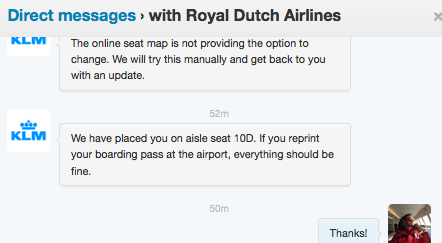 My latest round of Twitter DM’s with KLM – thank goodness I got an aisle seat! I’m actually a big proponent of using social media to your advantage and Tweeting, Facebooking and using any other means at your disposal to get a response from an airline or hotel. Airlines especially have proved faster at responding via Twitter than almost any other means – with American, Delta and JetBlue leading the pack – and the representatives manning the Twitter feeds are empowered to handle quite a few situations. Heck, even if you have a question for me, the chances of getting a quick response are much better if you Tweet me vs. email! 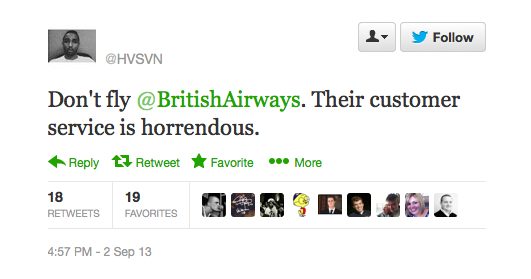 However, beware of complaining too often since airlines can flag you as a trouble passenger and stop responding. After all, if you cry wolf once too often, no one will believe you, and social media works both ways—if you’re going to complain when airlines do things wrong, you should consider praising them for good experiences. Apparently I’m not alone in leveraging social media though I haven’t gone to the lengths that I read about in this NBC story about a man who took matters into his own hands when British Airways lost his father’s luggage. Because it was a sponsored Tweet, Syed could target it at the timelines of UK and US users who follow British Airways’ Twitter feed – prompting a quick blitz of responses and supportive Tweets. And true to his word, he did – he kept Tweeting for over 8 hours before he got a response from the airline, who eventually found his father’s luggage and returned it to him…but not before thousands and thousands of Twitterers had picked up the story, the airline apologized publicly for the delay, and JetBlue’s VP of marketing wondered aloud on Twitter whether we were witnessing the birth of a new trend where disgruntled passengers would start buying sponsored Tweets to voice their dissatisfaction more loudly. While I doubt most people will actually spend money to send sponsored Tweets with complaints except in the direst of circumstances, I do think this is an interesting development, and one we’ll start seeing more and more in our Twitter feeds. In case you’re interested in Tweeting for yourself – or even buying a sponsored Tweets, here’s a handy list of airline handles to help you get your message to the folks who can help you.